Technology has always been a big boom for mankind. Technology is revolutionary and it brings necessary changes to our old strategies and techniques so that we can make our lives easier. We can see significant change of technological trends in 2016. 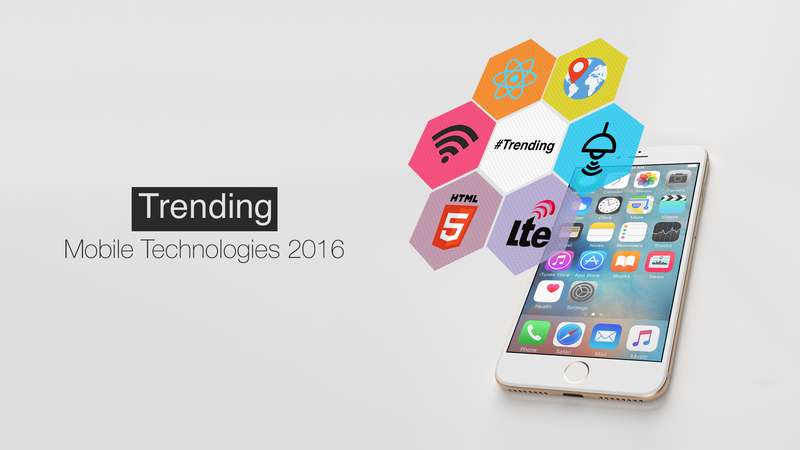 There are many exciting trending mobile technologies that made our life easier. Wearable Devices: Wearable Devices Technology takes further leap as the launching of smart watches proves the success of smart Wearable Devices. For Example: PTron Tronite One Bluetooth Smart watch Clock Synchronization SIM card. Great UX: Websites that will be visible accurately on desktop PCs, tablets, laptops, low-end phones, smart phones, TVs, and even on wearables! HTML5 enters in mobile: Upcoming devices will support HTML5 and there will be no need of Flash support anymore. There will be much better alternatives that will bring Flash to its end. Tools for Multi-platform or Multi-architecture Application Development: Tools will allow such applications to develop that will support Android, iOS and Windows which are three most popular platforms in the mobile industry. Advanced Mobile User Experience Design: Future designs will be aimed for better and playful user experience. High-Precision Location Sensing: Location sensing will be more efficient with the help of advanced Wi-Fi, ultrasonic beacons, imaging and geo-magnetics. New Wi-Fi Standards: The performance of Wi-Fi network will become much better in future with the necessary policy and standard advancements. Enterprise Mobile Management: Mobile management, security aspects and supporting technologies will be much more synchronized and competent. Mobile-Connected Smart Objects: Some general smart objects such as LED lights, domestic appliances, toys, medical devices, sports equipments and controllable power sockets would be controlled by smart phones. LTE and LTE-A: Long Term Evolution has an improved version of itself. LTE Advanced will take cellular technologies to the higher level. Metrics and Monitoring Tools: Application performance monitoring (APM) will make app testing easier for development of better user experience. At International Mobile World Congress (MWC) conference in Barcelona (City in Spain), Computer Weekly explored this topic with Kevin Curran, who is a reputed computer science lecturer at the Ulster University and he is also a senior member from the Institute of Electrical and Electronics Engineers (IEEE) to discover a few of the trends that are forming the eventual fate of this industry. Being an independent and experienced observer and spectator at MWC, Curran is allowed to talk more frankly than the endless array of exhibitors at the world’s biggest mobility trade fair, free of any kind of unnecessary PR minders and corporate obligation. There is probably some of his perspectives that are different from the mobile party line. Smartphone manufacturers seem to be in deep trouble since the smart phone technology is facing lack of advancements and momentous announcements. Wearable technology will present huge opportunities for smart phone suppliers such as Samsung or Apple. However, the fitness is actually a gimmick. Our standard ideas about 5G could be way off the expectations and it means that the next generation of the mobile network is yet to be defined. The idea of Autonomous cars is ready to be introduced but driver less seems to be further off the time. Drones seem to be just a thought that will certainly take off with time. Bio: Surya Kumar working at LatestOne.com as Digital Marketing Analyst. He is Freelance Blogger & Content Writer and likes to write about Smart Watches, Power Banks and all about Latest Tech & Gadgets. Find latest posts on FB, Twitter, G+.